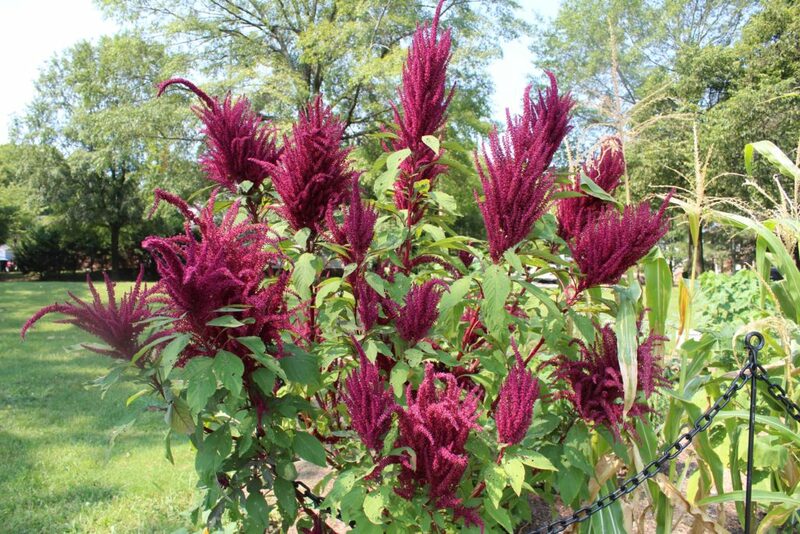 Amaranthus cruentus is an ancient and fascinating crop. A specific amaranth, Amaranthus cruentus, originally from Mexico and Guatemala, has been grown for 5,500 years. A. cruentusgrows to be 6-8 feet tall, with dark green to reddish leaves and vividly red or purple flowers—hence its common nickname, Blood Amaranth. It is a pseudo-cereal like quinoa, which means that it produces grains even though it is not a grass. Amaranth grows very quickly once established and tolerates warmer temperatures and less water better than many other plants. For these reasons, A. cruentusand other amaranth species such as A. caudatuswere widely spread throughout Mesoamerica and even some parts of South America. It the Aztec culture, A. cruentus—known as huauhtli—was not only an important staple food eaten almost as much as corn, but also an important religious food eaten on holidays and ground up to make a red dye for different festivals. The red dye colored the grains and leaves which were formed into figures of gods and then broken apart and eaten. When the Spanish conquistador Cortés arrived in Mexico in the 1500s, amaranth’s pagan use in those rituals caused the Spaniards to outlaw its cultivation. Since that time, amaranth’s fellow crops in the Aztec culture—corn, beans, and squash—have spread worldwide. Amaranth is still grown in a few pockets of its original habitat, but because of being outlawed by the Spanish centuries ago, its growth in Mesoamerica is very limited. In Mexico, it is still eaten today with honey in a snack called alegría(which means “joy” in Spanish). However, due to its hardiness in warmer climates, A. cruentushas taken a huge role in other societies. Today, the majority of A. cruentusis grown in northern India and Nepal, where the grains are eaten as cereal or ground up to make a flatbread. In Africa, a leafier form of A. cruentusis used and cooked much like spinach. Amaranth is extremely nutritious. It has a much higher protein density than most other cereals and is rich in lysine, an essential amino acid rarely found in plants. Amaranth’s hardiness, quick growth, and high nutritional value make it an ideal crop for poorer countries in warmer climates. For people in wealthier countries, like the United States, amaranth provides another staple crop that diversifies the too-few options that currently exist. Here in Tennessee, at Tennessee State University, research is ongoing on amaranth’s nutritional qualities. It very well could be a household food only a few years from now, given its amazing capabilities. Undoubtedly, amaranth was a crop of the past, and it looks very likely to be a crop of the future. Report of an ad Hoc Panel of the Advisory Committee of Tech. Innovation. Amaranth: Modern Prospects for an Ancient Crop. Rodale-NAS, 1985. Ritchie, Gary A. New Agricultural Crops. Westview Pr., 1979. Tull, Delena, et al. Edible and Useful Plants of the Southwest : Texas, New Mexico, and Arizona : Including Recipes, Teas and Spices, Natural Dyes, Medicinal Uses, Poisonous Plants, Fibers, Basketry, and Industrial Uses. Revised ed., 2013.